My favorite song on the album would definitely be "High and Dry". riffs and drum beats to create a sound all it's own. "Fake Plastic Trees", "Black Star", and "Sulk". All in all, this album fell way above my expectations. A brilliant album, this for me is Radiohead's second best outing, just behind the seminal OK Computer. Bullet Proof & Black Star are particularly sublime. now this is more like it. still not RADIOHEAD per se, it's still quite solid. aspiring to be U2, the band tones down the annoying grunge wannabeisms of the debut, and go in their own direction. delicate guitar melodies entertwine and then rock riffs erupt, thome york yells, falls off the roof of a trailer park, there's some piano, an orchestra, and it ends with their best song they ever did or ever will do, black star. i like it because it's not pretentious and pretty. not groundbreaking but nice and extremly melodic. The Bends was the first Radiohead album I owned, after hearing �fake plastic trees� and deciding it was one up on the earlier single �creep�, I bought the album. I was very impressed at the guitar work on it, and very impressed with the vocals. I was just genuinely impressed. This album is Radiohead�s more musical of the first 4 they put out. It is less experimental, but still has a great sound to it, filled with strong songs with character all their own. 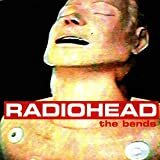 The Bends is something that any Radiohead shouldn�t have to be told to have in their collection, as it is an important collection of songs to see where they came from, as this is more of their debut than Pablo Honey was, since Pablo Honey seemed to be more of a demo than an album. If you don�t own The Bends, you need to. My favorite story about the Bends album is when one of the other band members was in his car on the way to Bristol listening to a tape of Thom playing some new accoustic songs he'd recently penned. So taken was he, that he stopped the car to listen to them. And spent the rest of the journey realising that Radiohead were going to only get bigger. You can only guess what those songs were but probably one or two ended up on the album (ie maybe Fake Plastic Trees, or Nice Dream, or Street Sprit perhaps}. For OK Computer fans, 'Just' sounds a bit like paranoid android. You can see the evolution occuring right before you. Some say the album is overproduced, and blame producer John Leckie for this. But OK computer is even more produced - it was produced entirely bythe band themselves. Mixing strong emotion with new and unique sounds was the direction they wanted to head, and that feeling is an essential part of the Bends.